King Solomon's Mines is a classic adventure novel that introduced the great white hunter Allan Quatermain to the world in the late 19th century. 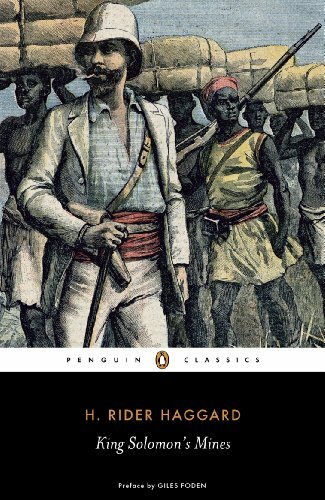 Written in personal narrative format (despite being fiction), the novel was hugely successful and tells the story of a group of Englishmen who set of into the hinterland of deep dark Africa in search of fabled treasure and the missing brother of one of their party. It should be noted, as advance warning for anyone looking to read this book, that Haggard was very much a product of the late Victorian era. Consequently, his attitude towards the indigenous people of Africa does not translate well to modern times. The book is extremely condescending and inherently racist towards the Zulu and Khoikhoi (referred to by the derogatory term Hottentot) people with constant reference to the word kafir, which is off-putting. However, if you are able to park this to one side, there is plenty of fun to be had amongst King Solomon's Mines' pages. Sir Henry Curtis and Captain Good are searching for Curtis' estranged brother who has gone missing whilst searching for the treasures that are believed to exist in the ages-old mythical mines of King Solomon. They fortuitously meet Quatermain on a boat in South Africa and by chance find out that he is in possession of a map detailing how to get the legendary mines. Adding to their party with African servants, including the mysterious Umbopa, they then set off in search of the mines and hopefully their fortune. As you might be able to guess from the pretty thin plot, a fair amount of deus ex machina occurs within the book, but this doesn't prevent King Solomon's Mines from being a good, fun read. Yes, it is pulp fiction and yes, tropes abound, but shamelessly I have to admit that their is something addictive about King Solomon's Mines. So addictive, that the novel spawned a further 14 Allan Quatermain stories, at least three movies and a book by Tahir Shah previously reviewed here on Best Travel Books. All told, this is an enjoyable boys-own adventure story that, while suffering from being a product of its time, most especially with regards the way in which it portrays indigenous peoples, manages to entertain and almost entrances you to begin searching for the lands of Kukuanaland. I have spoken.